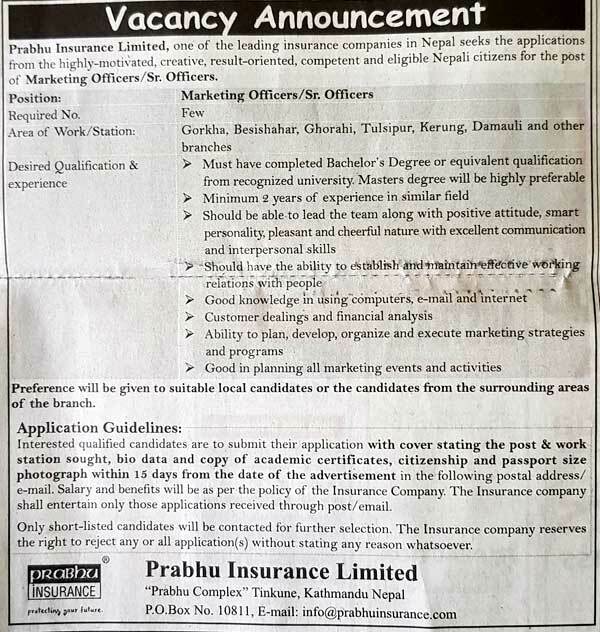 Prabhu Insurance Limited, one of the leading insurance companies in Nepal seeks the applications from the highly-motivated, creative, result-oriented, competent and eligible Nepali citizens for the post of Marketing Officers/Sr. Officers. Preference will be given to suitable local candidates or the candidates from the surrounding areas of branch. Interested qualified candidates are to submit their application with cover stating the post & work station sought, bio data and copy of academic certificates, citizenship and passport size photograph within 15 days from the date of the advertisement in the following postal address/ e-mail. Salary and benefits will be as per the policy of the Insurance Company. The Insurance Company shall entertain only those applications received through post/email. Only short-listed candidates will be contacted for further selection. The Insurance company reserves the right to reject any or all application (s) without stating any reason whatsoever.